I’m almost strictly a catch and release angler. But there is one thing I’m happy to keep from the water. The trip began with a heaping pot of Chesapeake Bay blue crabs done right with a healthy dose of Old Bay seasoning. 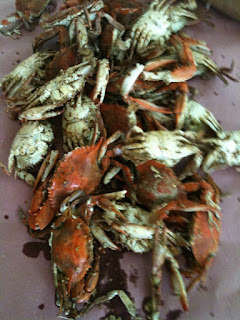 Fresh crabs out of the bay are one of my favorite things to eat and fortunately for me the crabs are here. On Saturday afternoon, I headed out with my father in-law and uncle in search of breaking fish in the bay. 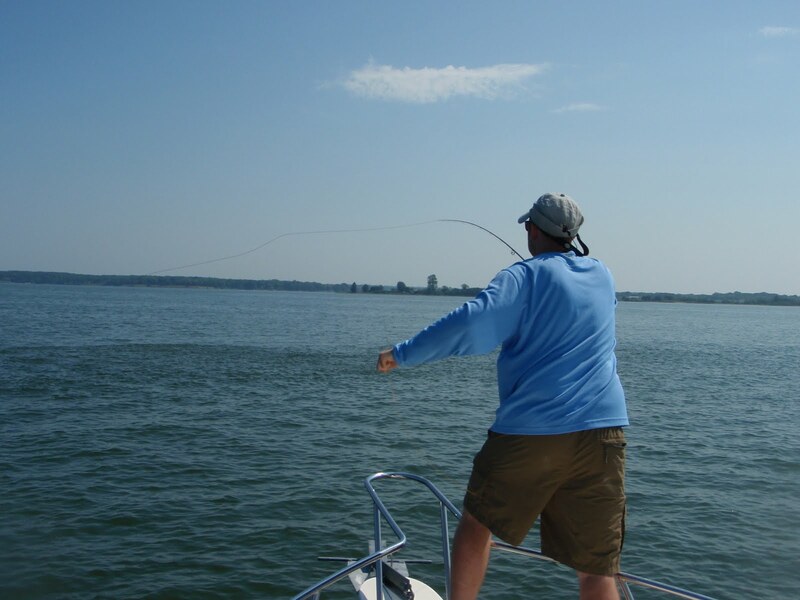 Specifically, we were hoping to find rockfish (striped bass everywhere else but Maryland & Virginia) chasing schools of baitfish. The drill is to run the boat until you see water “boiling” or a big flock of birds hovering over the water. It’s a little more difficult to find fish this way, but when you do, they make for great sport with an eight weight and a clouser. We didn’t find any this day but I did manage a few casts with a sink tip line in a place that looked fishy, but no luck here, either. Sunday night I had a few casts off the dock with a popper hoping to entice something as the sun set. Nothing doing, but I did get some good casting practice in. Monday morning I had a chance to get out my kayak. 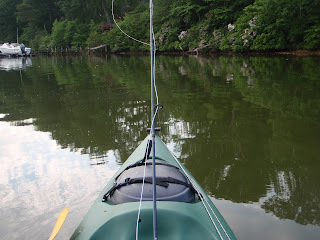 I use a Wilderness Ride that has a few rod holders on it along with my Scotty fly rod holder. 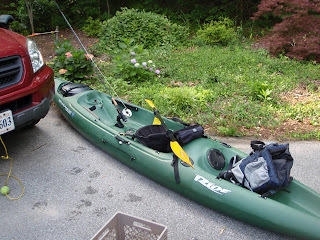 When I was looking for a kayak a few years ago, I wanted to buy the most stable one I could find. When you’re fly casting and fishing, you tend to move around a lot on the boat and I wanted something that wouldn’t flip and cost me a ton of gear. 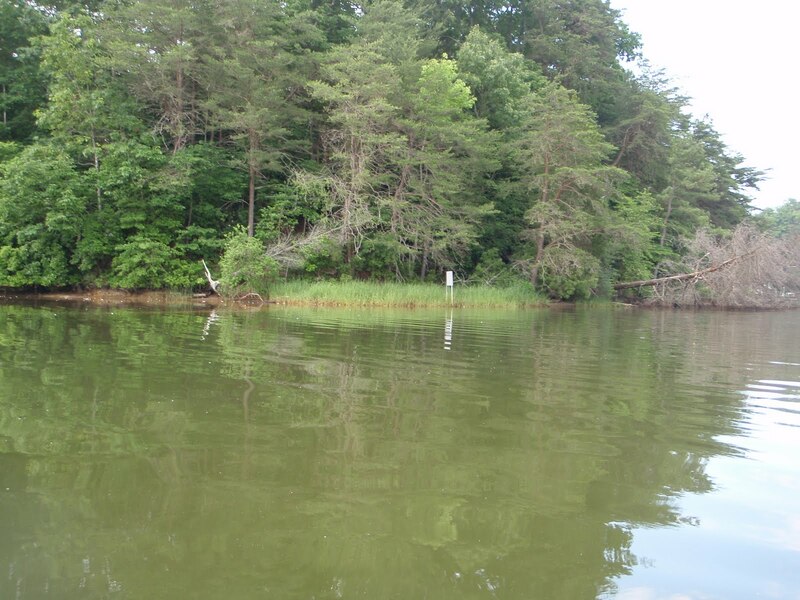 The Ride has a pontoon style hull that is perfect for what I do. I took the Ride out into a creek off the Saint Mary’s River which feeds into the bay and had a great early morning paddle. Unfortunately again, I didn’t get into any fish but that’s OK. The scenery was fantastic and the kayak really lets you enjoy some peace and quiet. The Ride and some local scenery. Looks fishy anyway, right? On Sunday afternoon, the whole family went out for a boat ride and I was smart enough to sneak my fly rod on board. We ran into a school of breaking fish which is a really exciting thing. After several casts into the school of fish, I saw that the fish were being chased by two huge rays and not the coveted Chesapeake Rockfish that I was hoping for. Me shooting some line to a school of fish. No dice, but check out the boil in the water. 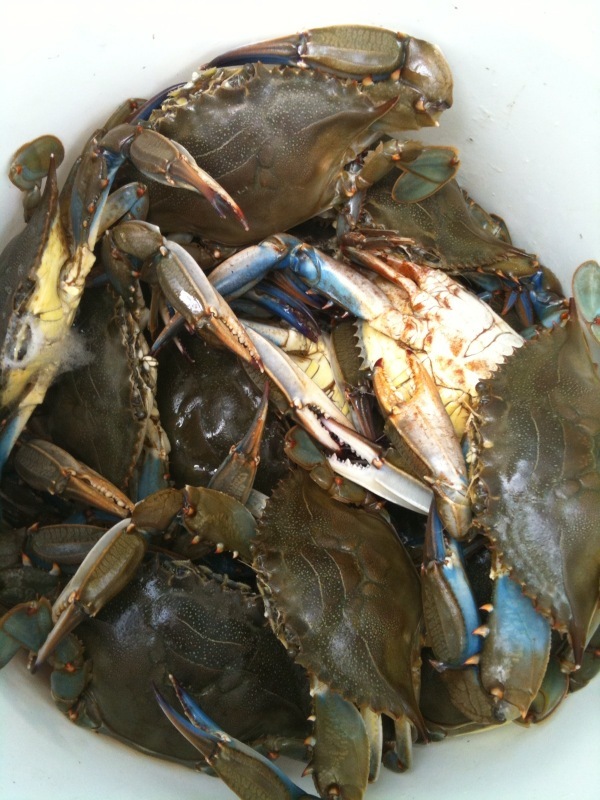 All in all a great trip hanging out with family and you can’t go wrong with Chesapeake Bay blue crabs. The fish on this trip just weren’t biting and I didn’t quite get as much on the water time as I had hoped. That’s not always a bad thing. I did get a lot of quality dad time which is important especially around the water. If the kids don’t like the water when they’re young, the probably won’t like it when they’re older either. And we all want our Fishy Kids to grow up and share our love of the water.